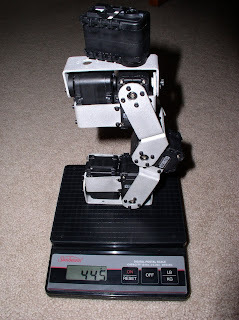 Heavily inspired by the Darwin OP robot by from Robotis and RoMeLa at Virginia Tech I have started A biped robot project. So far I have constructed a prototype leg and have begun developing the software while finalising the mechancial aspects of the robot. The prototype leg design I am working with is a copy of the stock Bioloid Premium Type A configuration as seen below. In this video I am demonstrating a simple pose, capture and playback program to test the range of motion in the leg and to make sure everything moves as expected. The program asks the user to pose the leg into two positions. Then does some simple linear interpolation between the poses, looping forever. In the next video I have a test program that demonstrates the inverse kinematics algorithm I have developed for the leg. In this program I am able to enter 4 values (x,y,z,rotation) to position the center of the foot in relation to what would be the center of the robot.